In the last 4 years, Batman has made a cultural resurgence into the hearts of many a fan, as well as introduced the worlds greatest detective to a whole new generation of followers. Since Christopher Nolan's re-boot of the film franchise, Batman is once again at the peak of his popularity. 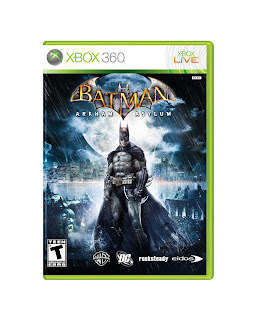 Flash forward to August of 2009, a fairly unknown independent development house out of London by the name of Rocksteady Studios, has just released the "Most Critically Acclaimed Superhero Game Ever" (Says The Guinness Book of World Records). And I'm keen on believing it. You should too. In fact, we're going to go crazy here, and tell you our score now - so you don't waste any further time in not playing this game. 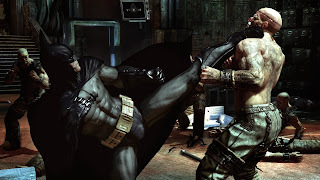 Mashbuttons gives Batman Arkham Asylum a 10 out of 10. If you do enjoy our wordsmithing, then by all means please continue and click the "read more" link for our full thoughts on the experience. 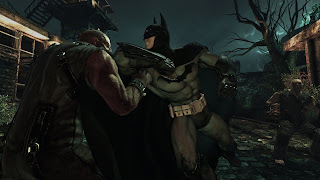 Batman Arkham Asylum follows no movie plot, it's not bound by Christopher Nolan's work, or story. It uses Arkham Asylum as the setting, the island maximum security prison sitting in the harbor (Alcatraz style). The folks over at Rocksteady have teamed up with a number Batman vets to bring the game and story to life. Written by Emmy Award winning, Paul Dini, and voiced by fan favorites Kevin Conroy (Batman) and Mark Hamill (The Joker). You begin this adventure having just apprehended the Joker. Game over, right? Wrong - it was all too easy. Turns out the Joker, who usually has a trick or two up his sleeve, is laying a trap from within the walls of the prison. After the initial title sequence of events, you begin to brawl with the inmates while the game teaches you the basic mechanics. That basic technique will greatly expand as you play through the next few hours. But difference situations call for difference play-styles. Do you take this room in stealth, or can you handle the few unarmed guards directly? Well that depends on whether they are unarmed or not and how many. The game sets up many possibly ways of approaching any given room, and even through the end of the game, it's fun to try out the myriad of options. Overall length of the game is roughly 8-10 hours on your first play-through, but there's plenty of reason to keep playing. After the game is complete, you're free to roam the Island, in search of all the secrets, and solve all of the Riddler's Challenges. Though I did yearn to knock a few thugs out while exploring. 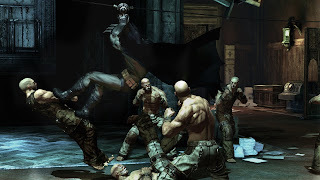 Speaking of additional gameplay elements, as you progress and unlock Character Bios, Character models, and interviews, you begin to unlock the "Challenge Maps"; a series of rooms that pits you up against rounds of enemies, racking up as many combos you can to increase your score, or even putting you in a situation, and giving you goals to best your score. Access this room, and try to knock out all the guards without them seeing you, or enter another room and fight off 4 increasingly difficult waves of enemies; do so to fine-tune your combo's. ...that's just how Bruce would've wanted it.